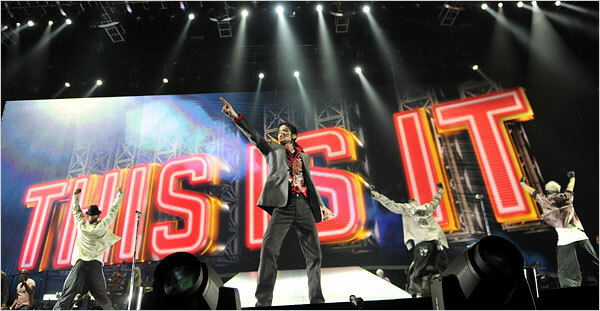 Work by Michael Jackson, shown rehearsing on June 23, sold extremely well after his death. As soon as the news of Michael Jackson’s death began to spread last Thursday afternoon, radio programmers around the country cued up his songs, and fans rushed to retail and online outlets to buy his music in quantities that broke records on Billboard’s sales charts. Many retail stores reportedly ran out of stock over the weekend, which might have contributed to Mr. Jackson’s remarkable sales tally online: 57 percent of his album sales were digital downloads, and 2.3 million downloads of single tracks were sold, separate from album sales. In the five years that SoundScan has tracked downloads, no artist has sold more than 1 million tracks in one week. Last year Mr. Jackson sold a total of 2.8 million tracks. The best-selling new album last week, “The E.N.D.,” (Interscope) by the Black Eyed Peas, will be No. 1 on the Billboard 200, though it had only 88,000 sales. It is the first time since 1991, when SoundScan began to provide reliable sales data, that Billboard can confirm that a catalog album outsold a new one. “The level of dominance by Michael Jackson on the top pop catalog albums chart is unlike anything we’ve ever seen on any Billboard chart, regardless if it occurred pre- or post-death,” said Silvio Pietroluongo, Billboard’s director of charts. For days after Mr. Jackson’s death, his albums occupied most of the top slots on the running music sales charts for iTunes and Amazon.com. The most popular tracks online were “Thriller,” with 167,000 downloads in the United States; “Man in the Mirror,” with 165,000; and “Billie Jean,” with 158,000. On the radio the hierarchy of hits was slightly different. “Billie Jean” was by far the most popular, with more than 4,500 spins through Sunday, according to Nielsen BDS, which monitors airplay. “Thriller” was next, with nearly 3,600, followed closely by “Rock With You.” Over all, radio play for his songs was 18 times what it was the week before. Predictably, in the hours and days following the news of Mr. Jackson’s death, at 50, his music became ubiquitous on radio. But the increase in airplay was made more dramatic by the fact that in recent years Mr. Jackson’s songs have had relatively little. In the three days before his death, for example, “Billie Jean” had only 94 spins on the 1,600 stations that Nielsen BDS monitors across the country; in the ratings blocks between 3 p.m. and midnight on Thursday (he died at 5:26 p.m. Eastern time), when many stations went wall-to-wall Michael Jackson, it logged 1,011. But airplay began to trail off on Monday. Catalog sales often spike in the days and weeks after a superstar dies, but Mr. Jackson’s sales were extraordinary even in that context. Sales of Nirvana albums, for example, increased by more than 150 percent, to 77,000, the week after Kurt Cobain died in 1994. When the Notorious B.I.G. was killed in 1997, his album “Life After Death” was just about to be released. It sold 689,000 copies in its first week. On this week’s regular Billboard 200 chart, sales were much less spectacular. The Jonas Brothers’ “Lines, Vines and Trying Times” (Hollywood) has fallen one spot to No. 2 in its second week out, with 68,000 sales, a drop of 72 percent; and Regina Spektor’s “Far” (Warner/Sire) opens at No. 3 with 50,000. The Dave Matthews Band’s “Big Whiskey and the GrooGrux King” (RCA) is No. 4 with 47,000, barely 100 more than Eminem’s “Relapse” (Interscope).